My son is turning two on Friday, and we had a little birthday party for him last weekend. He’s all about trains, trucks, cars… anything with wheels, really. So I decided to throw a train-themed party. 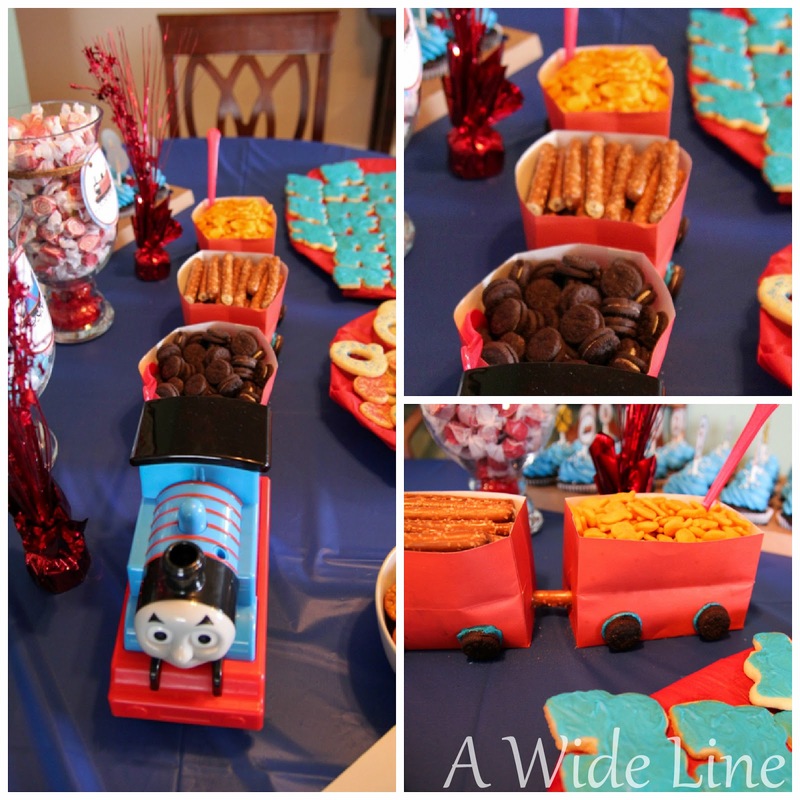 Quinn is a huge fan of Thomas and Friends, and I could’ve made it a whole lot easier on myself by throwing a Thomas-themed party. But the mark-up on anything with that brand is astronomical, so I knew I would save a ton of money by going with a general train theme instead and designing everything myself. Yes, it was a lot more work, but also a lot more fun. I bought this “Toy Trains” kit from ScrapGirls.com, a digital scrapbooking website. It contained all the graphics I needed for the project. I’m not very proficient in Photoshop, and that software is prohibitively expensive, so I designed everything you see here using a combination of Microsoft Power Point, Paint.Net (a free and awesome download that does everything I would need Photoshop to do), and the MyMemories digital scrapbooking software. I printed everything myself at home on white cardstock and sticker paper. The invitation included a ticket, which I “borrowed” from a quick Google image search, modified using Paint.Net, and printed on white cardstock. I wrote “Track No. 3, Seat No. 8” in the upper right because Q’s actual birthday is March 8th. The “All Aboard” ticket sticker for the envelope (printed on sticker paper and cut out) and the return address label with a train image made nice finishing touches. I posted train signs and flag banners all around the house. Above the doorway as guests entered, I posted a “To Trains” banner. Since we have a baby gate there, I thought I would dress it up like a train crossing signal. Over the doorway to the family room, I put up a “Platform #2” sign, choosing the number two because it’s Q’s second birthday. I bought some blue paper lanterns and a red fluffy thingy from the party store, and Hubs hung them from the ceiling in family room. I printed and cut out a few train images from the graphics kit and attached them to the decorations. I easily flipped the images in Paint.Net, cut them out and glued them together so the train could be seen from both sides. In the family room, Hubs put together Q’s new train table. This was a great addition to the party. It was small enough not to take up a ton of space, yet big enough for all the kids to stand around it, and there were plenty of trains to go around. You should have seen Q’s face when he woke up on Saturday and saw it. It was like Christmas morning all over again. In the kitchen, I set up the food and drink stations. I saw this pin and thought it would be hilarious to put up small signs that said “Chugga Chugga” near the drinks and “Chew Chew” (instead of “Choo Choo”) near the food. I found a free font called Alpha Smoke to make the letters. Over the food table, I hung a “Happy Birthday, Quinn” banner, which I designed and printed using the graphics kit and Power Point. I created another train crossing signal with black, white and red cardstock, a thin, wooden dowel from Michael’s, and a foam cube covered in black gift wrap. I wanted to make a train with freight cars filled with food as a center piece. Quinn’s remote control Thomas train was the perfect size, so I used that for the engine even though it wasn’t really a Thomas party. For the freight cars, I didn't have any red ceramic dishes like in the original pin, so I bought small red gift bags and cut them down to the size I wanted. I poked holes in the sides and connected them with thick pretzels. I used left over frosting to stick mini Oreos on the front of the bags to make wheels. I filled the first freight car with mini Oreos to look like a coal car, I filled the second one with thick pretzels that I broke in half to look like logs, and I filled the last car with Goldfish crackers because… well, kids like Goldfish. I made frosted sugar cookies in shapes of train engines, the letter “Q,” and the number “2.” It took a few attempts to get these cookies right, and even then I screwed up by making a cream cheese frosting which doesn’t harden very well. Oh, well. They tasted better than they looked, but more on that culinary adventure in a future post. I purchased cupcakes from a locally famous bakery. I designed the cupcake decorations using the graphics kit, printed them on cardstock, cut them out, and taped them to 4” lollipop sticks. I filled my hurricane vases with blue and red taffy (raspberry and red licorice flavors) that I found at a local candy shop. I made the train pictures and attached them to vases with leftover twine from my fall wreath. This was a cute idea for a table decoration, but the problem is no one knew they could eat it, and now I have all this taffy leftover. Anyone want some taffy? Anyone? Bueller? At the drink station, I served a blue punch I called “Choo-Choo Juice,” made with Polar Ice flavored Hawaiian punch, 7-UP, pineapple juice and apple juice. I just happened to find some cute red and white paper straws at the store one day, and I thought they made a cute addition. And since we’re The Kirtleys and all of our parties include some sort of adult beverage (yes, even a child’s birthday party at 10:00 in the morning), we also served mimosas. The menu was all easy stuff. I made my barbecue pulled pork in the crock pot, and guests made their own sandwiches. For sides, we served cole slaw and potato salad from the grocery store deli counter, chips and dip, and a veggie tray. The kids noshed on peanut butter and jelly sandwiches. I had big plans to use my train engine cookie cutter to make train-shaped sandwiches, but the plastic cookie cutter wasn’t sharp enough to cut through the soft bread, and the shapes were unrecognizable. I could’ve made it work if I had had more time, but I decided that was too much effort for the morning of the party, so the kids ate regular ol' half-sandwiches. I’m kinda bummed about that. It would’ve been really cute. In the loot bags, I included conductor hats (I decided not to make party hats this year!) and red bandanas, train whistles, wind-up toy trains, train pencils, train coloring pages (free printables I found online) with crayons, a train sugar cookie with the kids’ names on them (which turned out terribly), and a train-themed mix CD. A Disney Junior band called Choo Choo Soul inspired the mix CD. I included a few of their train related songs, such as “Chugga Chugga Choo Choo,” “Steam Train, “Bullet Train,” and “Blue Zoo Train.” I also added some of Quinn’s favorite Sesame Street songs that I found on YouTube. From what my mommy friends tell me, the kids love their new music. I designed the CD covers to match the invitations, and I included a track list on the inside. All that creative energy kept me pretty busy after Q went to bed while Hubs was out of town. The lack of sleep paid off though. Everything turned out great, and Quinn and his friends had a really good time. 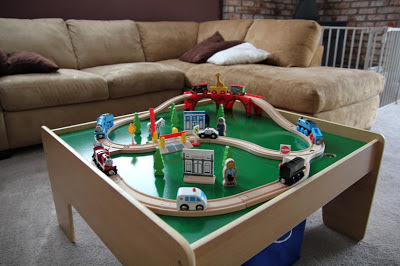 When Q woke up on Sunday, he said he wanted another train party. 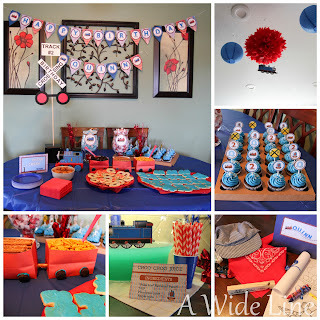 Plus, this was great practice for my next project: a train-themed Big Boy Bedroom for Quinn! Now that’s he’s two, he’s way too old for the baby nursery. Just reading about all that work exhausted me ;-) Well done, mama! This has to be the cutest party I have ever seen! 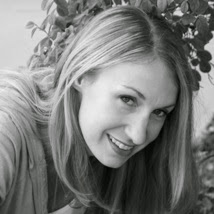 I LOVE your theme, you are so creative! Thanks for linking up!